June 8th is World Oceans Day. It is an international day of oceanic recognition where we celebrate and work towards protecting the world’s oceans! To bring the ocean to a new community we are taking over reddit, the self described "Front Page of the Internet." Through a series of AMAs (Ask Me Anything), reddit community members from diverse fields including science, tech and even gaming industries will ask the AMA participants any question that comes to mind. A process that ends up possibly asking better questions than a CNN interview. There are going to be a number of interesting AMAs on our schedule and a slew of amazing participants. In addition to the reddit questions-and-answer periods, we will also be holding a Google hangout. 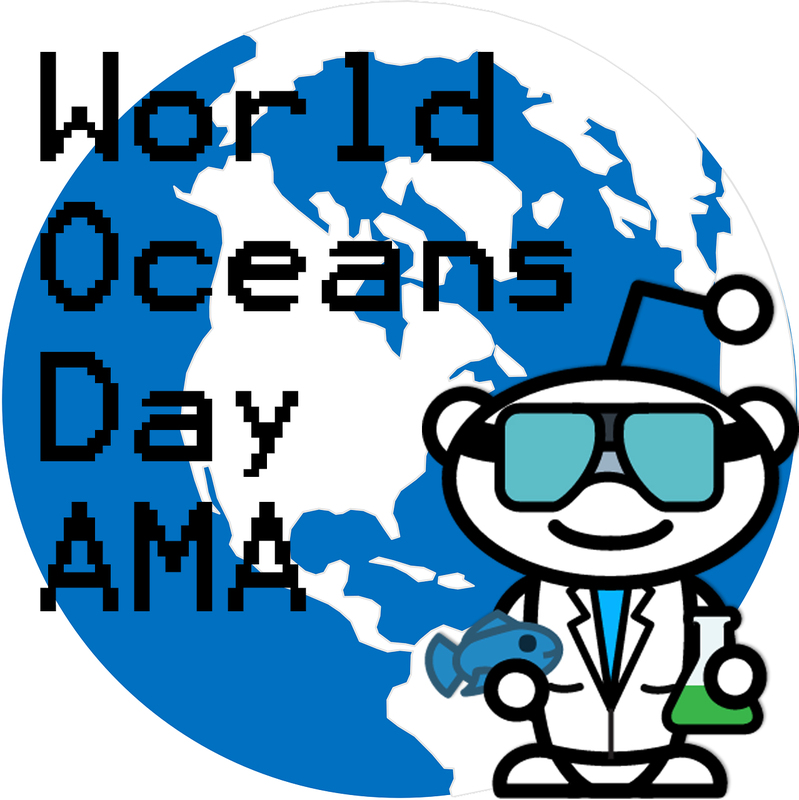 Here is the tentative schedule for all oceans AMAs on reddit. Once the AMAs go live, we will list them here with links directing you to the conversations. For now, the best place to keep tabs on these AMAs are in the Science Subreddit. Dr. Samantha Joye, a microbiologist and geochemist, from the University of Georgia who studies hydrocarbon and elemental cycling in coastal and ocean waters. She is a leading explorer of seafloor cold seeps, where methane and oil vent from the seafloor and also works in coastal regions impacted by hypoxia. Dr. Joseph Montoya, a biological oceanographer at the Georgia Institute of Technology, studies ocean nitrogen cycling and ocean food webs, focusing on elucidating the factors that regulate carbon flow through the ocean’s food web. Beth Terry - After learning about the devastating effects of plastic pollution on the environment and human health, Oakland accountant Beth Terry began an experiment to see if she could live without buying any new plastic. Since then, she has reduced her plastic waste to less than 2% of the national average. That experiment turned into the popular blog MyPlasticFreeLife.com and new book Plastic-Free: How I Kicked the Plastic Habit and How You Can Too. A founding member of the Plastic Pollution Coalition, Terry gives presentations on plastic-free living and why, despite what some critics assert, our personal actions really do make a difference. Her work and life have been profiled in the award-winning film Bag It, as well as Susan Freinkel’s book, Plastic: A Toxic Love Story and Captain Charles Moore’s Plastic Ocean. Marcy Cravat is the director of Angel Azul, a film that explores the artistic journey of Jason deCaires Taylor, an innovative artist who combines creativity with an important environmental solution; the creation of artificial coral reefs from statues he's cast from live models. When algae overtakes the reefs however, experts provide the facts about the perilous situation coral reefs currently face and solutions necessary to save them. Alyssa Isakower has been coordinating World Oceans Day and helping The Ocean Project with digital communications for the past five years. She’s interested in social media, social change, and growing social causes’ capacity for effective communication. She’s also a big fan of wetlands, and once lived at sea for 3 months. Jonah Bryson is a 15 year-old award-winning filmmaker and musician. Born and raised in the south of France, Jonah fell in love with the oceans. At age 13, Jonah starting directing his first feature A Sweet Spot in Time, a documentary about the fight for his generation's future and making the world a better place. The film features astronaut Chris Hadfield and National Geographic oceanographer Dr. Sylvia Earle. It was filmed by Emmy award-winning cinematographers, with music by world renowned musicians, including Taylor Swift's band, who Jonah recorded an original song with for the film. Dr. Ajit Subramaniam, a biological oceanographer from Columbia University, uses remote sensing and autonomous instruments to study the patterns of and regulation of primary production in the oceans. Dr. Dana Yoerger is a Senior Scientist at Woods Hole Oceanographic Institution in the Deep Submergence Laboratory, where he leads the SENTRY, an AUV (Autonomous Underwater Vehicle), team. Bruce Strickrott is an ocean engineer who manages the ALVIN group. ALVIN a submarine, a Human Occupied Vehicle (HOV) research submersible that has made numerous amazing discoveries, including locating and filming the Titanic. Liz Taylor is the President of DOER (Deep Ocean Exploration and Research) Marine, a company that builds research submersibles and other deepsea exploration tools. Dr. Claire Simeone is a Conservation Medicine Veterinarian working with the Marine Mammal Center. She has been instrumental to the recent sea lion crisis where over 1450 sea lions have been beached, needing veterinary assistance. David Shiffman is a marine biology graduate student at the University of Miami, where his research focuses on shark ecology and conservation. David has interacted with thousands of sharks on five continents through research and recreational SCUBA diving. He has written about marine biology and conservation for the widely ocean blog SouthernFriedScience.com, as well as for Scientific American, Slate Magazine, and other outlets. Andy Casagrande is a videographer and film producer with a love of marine animals. He has captured amazing footage of everything from killer whales to sharks and has had his content used in documentaries and Discovery's infamous "Shark Week." Dr. Jenna Jambeck is an assistant professor in the College of Engineering at the University of Georgia (UGA). She received her Ph.D. in environmental engineering from the University of Florida. She then worked for the U.S. EPA Office of Research and Development in Research Triangle Park, N.C. as an ORISE post-doc. She became a research professor at the University of New Hampshire and then moved to the University of Georgia in 2009. She has been conducting research on solid waste issues for 19 years with related projects on marine debris since 2001, especially projects related to location and spatial analysis of debris, debris quantification and characterization, and technology/mobile device usage (mapping, etc.). She also specializes in global waste management issues and plastic pollution. In November 2014 she sailed across the Atlantic ocean with 13 other women in eXXpedition to sample land and open ocean plastic and encourage women to enter STEM disciplines. She was principal investigator of the NOAA partnership the Southeast Atlantic Marine Debris Initiative (SEA-MDI) and co-developer of the mobile app Marine Debris Tracker, a tool currently being used in a global citizen science initiative to log marine debris throughout the world. Meg Chadsey is the Ocean Acidification Specialist and NOAA PMEL Liaison for Washington Sea Grant. She produces OA outreach materials for broad range of audiences, from K-12 students to the scientific community. She collaborates with educators to develop course and field work that is accurate, engaging and relevant. She has participated in state-led efforts to address OA (Governor Gregoire’s Blue Ribbon Panel on Ocean Acidification, and the ongoing work of the Marine Resource Advisory Council), and is part of a scientific team that is gearing up to test a novel OA-mitigation strategy in Puget Sound. Rob Foos is a former Coast Guard officer where he commanded a ship, served on three regional fishery management councils, and led fundraising efforts across the federal government in south Florida. He is currently the Director of Development for The TerraMar Project. The Symposium will also be hosting a Google Hangout on June 8th with participants in the recent ocean advocacy effort, the Blue Vision Summit.